Kevin, GW0KIG, has just written in his blog about struggling to brush up his Morse. He first learnt the code at the age of 19 and has "memories of a Morse code tutor program on a borrowed ZX81 computer (remember those?)" 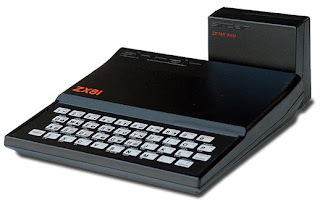 I remember the ZX81 and its wobbly 16KB RAM pack very well. In fact, a Morse tutor was one of the first programs I wrote for it. I wrote an article for Short Wave Magazine which described the program, together with a Morse keyboard with programmable memory and a high-speed Morse sender for meteor-scatter work. It is amusing today to read my conclusion that "it is possible to program the ZX81 to create sophisticated memory keyers." These primitive programs would hardly seem sophisticated today. The article was published in the August 1982 issue of Short Wave Magazine. I kept a copy and you can see it here. I wonder if my program was the one Kevin used to learn Morse when he was 19? One of these days I might try downloading a ZX81 emulator and see if these old programs will run on it. Yes I had a 48K Spectrum as well. Wrote a morse tutor for that, too. I even wrote a morse decoder that worked quite well on strong signals fed into the cassette port. I never had a QL though. My next home computer was an Amstrad PC1512, an IBM PC clone and a real computer! The ZX81, that takes me back to my friends house aged 13, watching this bizarre skier scrolling game, I was in total awe ! I ended up getting an 'O' level in Computer Studies thanks to the old ZX and yes it's wobbly RAM pack, I think my qualification may be a little out of date now..